We are experiencing intermittent problems when accessing ScienceDirect articles via Summon from off-campus. 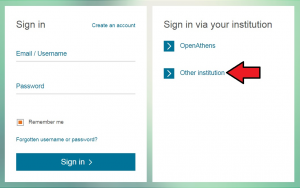 When you try to access an item you have located via Summon, usually you should be prompted to login to the University Single Sign On login page before being directed to the resource (with access). Due to an issue with Summon and the authentication method we use for the ScienceDirect platform, the Single Sign On login is not loading for every ScienceDirect result found in Summon. You will still be directed to the article, but without the Single Sign On login. If you are off-campus you will not be recognised as a University of Reading member, and therefore will not be granted access. If you are on-campus you should have access automatically due to IP address recognition. To avoid this issue, you can navigate to the journal you require via the E-journals Finder (please search here with the journal rather than article title). When you reach the ScienceDirect platform you will need to use the search function or select the correct volume/issue to find your article. If you have any on-going issues, please feel free to contact us via eresourceshelp@reading.ac.uk or by submitting an e-resources problem report form. We are currently experiencing intermittent problems when downloading PDF files from the Sage journals platform. When attempting to download an article you may be presented with a ‘Failed to load PDF document error’. -If you are on-campus, please use the databases a-z on-campus link to Sage journals. Then make a search for the article you require, and you should be able to download it with no issues. -If you are off-campus, please use this link to Sage journals then click ‘Institution’ then ‘Shibboleth’ in the top right corner. 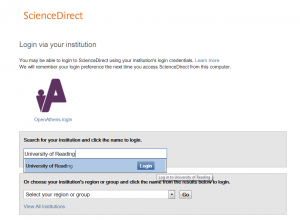 Then select ‘United Kingdom – UK Federation’ and then ‘University of Reading’ from the list. You should then be prompted to login with your University username and password. If you have any problems with the workaround above, or any other problems with electronic resources, please submit an e-resources problem report form for help. New online resources – try them now! We now have access to a number of newly purchased online resources – available to use from on- and off-campus. Thesaurus Linguae Graecae -the Thesaurus Linguae Graecae (TLG) contains the majority of the surviving literary texts written in Greek from Homer to the fall of Constantinople. Worldwide Political Science Abstracts – references to publications covering political science and international relations, including international law and public administration/policy. Includes journal articles, books, book chapters, dissertations, and working papers, from 1975 to the present. Drama Online: Shakespeare & Early Modern Drama Videos – a new addition to our existing Drama Online collections, covering key plays and acting techniques, including Maxine Peake’s Hamlet, Stage on Screen, and a Shakespeare Acting Masterclass from Patsy Rodenburg. Oxford Handbooks Online – we now have access to the new 2017 Literature collection, 2016 and 2017 Linguistics collections, and the 2017 History collection. Oxford Scholarly Editions Online – access is now open to three more collections: Renaissance Drama, Renaissance Poetry, and Renaissance Prose. Routledge Historical Resources: History of Feminism – this resource provides access to materials on feminism (covering the period 1776-1928) published by Taylor & Francis. It includes primary and secondary sources, such as full books, selected chapters, and journal articles, as well as thematic essays. 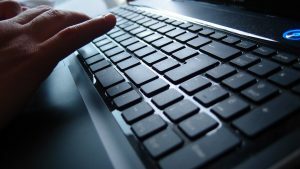 The library provides access to many more online resources – you can find more information on our E-resources webpage. You can also find resources relevant to your subject by exploring your subject guide. We are pleased to say that the problems with downloading PDFs from ScienceDirect have been resolved and you should be able to use this resource as normal. You may need to clear your browser cache and cookies first. If you experience difficulties accessing any of our resources please fill in the E-resources problem report form and we will do our best to assist you. Problems accessing ProQuest resources via Summon – resolved! We are pleased to confirm the issues linking from Summon to ProQuest resources have now been resolved. If you experience any problems with any electronic resources, please do contact us via an E-resources problem report form. We are currently experiencing problems using the Institutional Sign In feature on the Oxford Academic platform. You should only need to use this Sign In on the Oxford Academic site when off-campus, so on-campus users should not be affected. 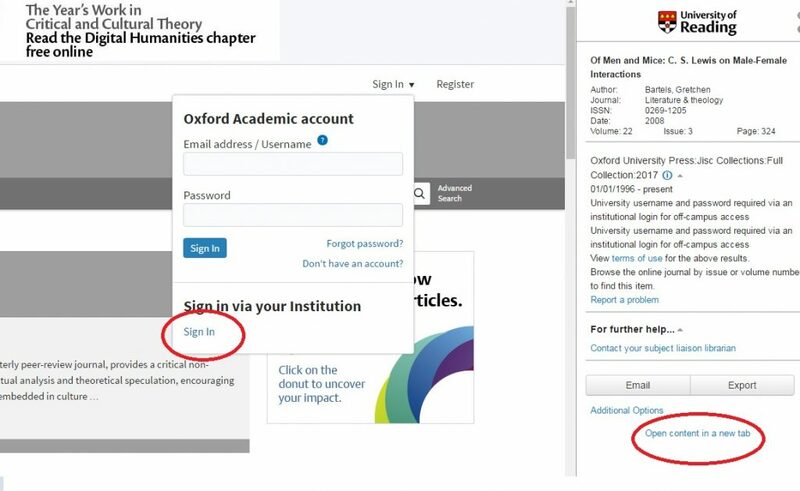 When a user links to an article on the Oxford Academic platform via Summon, the Summon ‘frame’ prevents the Institutional Sign In link on the site from working – nothing will happen when you click the ‘Sign In’ link. To work around this problem, please click the ‘Open content in a new tab’ button in the Summon sidebar, as indicated below. This should open the page in a new tab, and you should be able to click ‘Sign In’ successfully. If you navigate to the platform via a route other than Summon, e.g. the E-Journals Finder you should not experience this problem. We are working with the supplier to fix this, and hope the issue will be resolved soon. If you have trouble accessing any online resources, please contact us via an E-resources problem report form. We are pleased to say that the problems with access to LexisLibrary have been resolved, and you should be able to use this resource as normal. Some users may need to clear their browser cache and cookies before using this resource again. If you experience further problems, please do get in touch with us via an e-resources problem report form. We are pleased to say that the remaining problems with access to ScienceDirect have been resolved and you should be able to use this resource as normal. If you regularly use the Library’s e-books, you may have noticed that we now have access to a new e-book platform. E-books which were hosted on the EBL and ebrary platforms have moved and are now available on ProQuest’s new Ebook Central platform. The interface of the new Ebook Central platform is very similar to the EBL platform so you may not even notice a difference! If you’ve bookmarked an EBL or ebrary e-book, you will automatically be re-directed to the e-book on Ebook Central. Links from the Library website will also take you to Ebook Central. If you had created a bookshelf on EBL you will find that it has already migrated to Ebook Central. If you had created a bookshelf on ebrary, you will be prompted to move your bookshelf contents to Ebook Central when you first log in to access an e-book. As with EBL and ebrary, you will be able to download E-book Central e-books for a limited time period using the free Adobe Digital Editions software. You will now also be able to download e-book chapters as simple PDFs which can be read using the free Adobe Reader software and saved to your device. Up to 40% of an e-book can be printed or downloaded in chapters, and up to 20% of an e-book can be copied. The exact pages available for you to print/download or copy will be displayed in each e-book. To find out more about Ebook Central, take a look at ProQuest’s Ebook Central LibGuide. If you have any questions or problems locating the content you need on Ebook Central, please get in touch with us by submitting a problem report form. From 17:00 until midnight on Saturday 29 October it may not be possible to link to resources via Summon, the Item Finder, and the E-journals Finder. 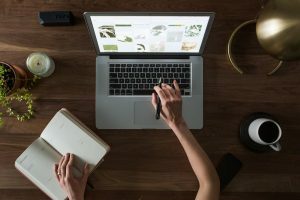 This is due to ProQuest upgrading some of their products and services which means links to journal articles and other online resources may not work. During this period if you know which journal you need to use, try going directly to that journal via a search engine – if you are off-campus you will need to look for an institutional login option to gain access. If you have found an interesting book chapter on Summon, but can’t link to it, try searching for the book title on the Enterprise catalogue and then browsing the e-book for the chapter you need.